Better control over the delivery of drugs to specific sites in the body at specific times would reduce unwanted side effects and improve medical treatment dramatically. ‘Smart’ polymers are promising materials for controlling drug delivery, since they change their properties in response to specific stimuli. However, they usually require continuous stimulation to maintain these changes. 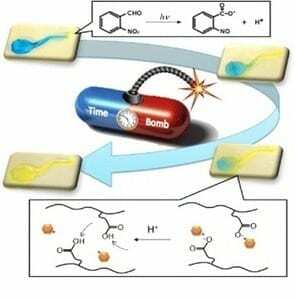 Now, researchers led by Takao Aoyagi at the MANA, National Institute for Materials Science, Japan, have developed an approach that could allow more subtle control and timing of drug delivery. The new technique uses hydrogels, which are a type of ‘smart’ polymer made of water-soluble long-chain molecules. The team first showed that they could control the acidity inside a hydrogel by loading it with a compound called o-NBA. This releases protons, which increases acidity, when irradiated with UV light. When o-NBA-loaded hydrogel was irradiated, acidity increased inside; if only part of the gel was irradiated, acidity throughout increased gradually as protons diffused. Aoyagi and his colleagues then loaded hydrogel with o-NBA and L-DOPA, a precursor of the brain chemical dopamine that is used in the treatment of Parkinson’s disease. The change of acidity in the gel upon UV irradiation caused L-DOPA to be released because the acidity disrupted the interaction of L-DOPA with the molecules in the gel. Irradiation with UV not only enhanced overall L-DOPA release from the hydrogel, but also caused an extra ‘explosive’ release five hours after irradiation. This allowed the drug release to be timed, as well as triggered, in a controlled way.